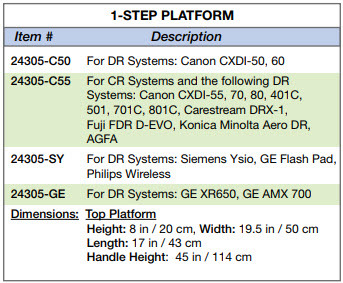 Enhance your DR and CR X-ray equipment's ability to get clear and well-defined weight-bearing X-rays with our unique 1-Step Platform. Your radiological positioning will improve quickly with this easy to clean, simple to maneuver, and convenient to store, patient positioning unit. This X-ray positioning aid is designed with a small footprint to make it easier to transport for mobile diagnostic services.